Masahide S., Naotsugu I., Noboru S., Hydrogen production from the gasification of ...  Yamaguchi A., Hiyoshi N., Sato O., Bando K.K., Osada M., Shirai M.,. SANDRA M. LANDUYT,1* EDWARD J. HSU,2 BI-TAR WANG,2. AND SAN-SAN TSAY2. Penn Valley Community College, Kansas City, Missouri 64111,1 and. The heating of the cell was performed using a band heater disposed around the cell ..... Bordeaux I (Programmes pluri-formation nÂ° 971022 et 990814) is grate-. test program conducted in 1999 by GA for Environmental Energy Systems Inc. (EESI) in a ... negligible emission of criteria pollutants, including particulates, NOx, SOx, and ... equipment that minimizes capital cost and footprint requirements. Biorefining replaces the classical pulping methods based on Kraft, sulphite and soda reagents with a hydrothermal treatment followed by organosolv pulping. 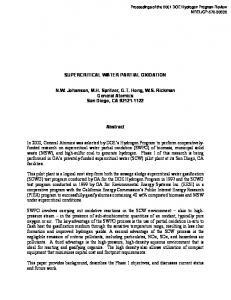 Written for presentation at the 2009 ASABE Annual International Meeting Sponsored by ASABE Grand Sierra Resort and Casino Reno, Nevada June 21 – June 24, 2009 Mention any other presentations of this paper here, or delete this line. Abstract. Thermochemical liquefaction of the various lignocellulosic biomass: corn stover, aspen pulp wood (Populus tremuloides) and grasses, was studied under subcritical and supercritical conditions. The liquefaction yields were found to be dependent on the final liquefaction temperature, the length of liquefaction time and biomass composition. The major compounds of the liquid products from the various origins were identified by GC-MS. The composition of liquid products is found to depend on the composition of the raw materials. The authors are solely responsible for the content of this technical presentation. The technical presentation does not necessarily reflect the official position of the American Society of Agricultural and Biological Engineers (ASABE), and its printing and distribution does not constitute an endorsement of views which may be expressed. Technical presentations are not subject to the formal peer review process by ASABE editorial committees; therefore, they are not to be presented as refereed publications. Citation of this work should state that it is from an ASABE meeting paper. EXAMPLE: Author's Last Name, Initials. 2009. Title of Presentation. ASABE Paper No. 09----. St. Joseph, Mich.: ASABE. For information about securing permission to reprint or reproduce a technical presentation, please contact ASABE at [email protected] or 269-429-0300 (2950 Niles Road, St. Joseph, MI 49085-9659 USA). The authors are solely responsible for the content of this technical presentation. The technical presentation does not necessarily reflect the official position of the American Society of Agricultural and Biological Engineers (ASABE), and its printing and distribution does not constitute an endorsement of views which may be expressed. Technical presentations are not subject to the formal peer review process by ASABE editorial committees; therefore, they are not to be presented as refereed publications. Citation of this work should state that it is from an ASABE meeting paper. EXAMPLE: Author's Last Name, Initials. 2009. Title of Presentation. ASABE Paper No. 09----. St. Joseph, Mich.: ASABE. For information about securing permission to reprint or reproduce a technical presentation, please contact ASABE at [email protected] or 269-429-0300 (2950 Niles Road, St. Joseph, MI 49085-9659 USA). Introduction Biomass is the renewable energy source of choice for the production of liquid transportation fuels. Significant quantities of ethanol are currently being produced from corn and sugar cane via a fermentation process. Utilizing lignocellulosic biomass as a feedstock is seen as the next step towards significantly expanding the ethanol production capacity. However, in addition to substantial technical challenges that still need to be overcome before lignocellulose-to-ethanol becomes commercially viable, any ethanol produced by fermentation has the inherent drawback that it needs to be distilled from a mixture, which contains 82% to 94% water. Instead, direct thermochemical conversion of lignocellulosic biomass to bio-crude oil or fuel gases has been proposed as an alternative, which does not require distillation, thus resulting in less energy input per unit of energy output. There are two typical thermochemical conversion processes: Pyrolysis and liquefaction. During the pyrolysis processes, the biomass feedstock is heated in the absence of air, forming bio-oils and a gaseous product, which then condenses(Demirbas, 2000;2004). Liquefaction of biomass produces water-insoluble bio-crude oil by using treatments at high pressure (5-20MPa) and at low temperatures (250-450○C). The advantage of liquefaction is that the bio-crude oil produced by liquefaction is not miscible with water and has a lower oxygen content, and therefore a higher energy content than pyrolysis-derived oils (Goudriaan et al., 2001; Huber et al., 2006; Zhang et al., 2008a). A supercritical fluid is any substance at a temperature and pressure above its thermodynamic critical point, which is defined in terms of the critical temperature and critical pressure. Water (H2O) is a supercritical fluid above 374°C and 22.1 MPa. 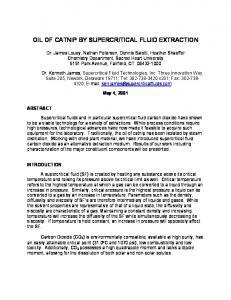 Recently, a supercritical fluid treatment has been considered to be an attractive alternative in science and technology as the solvent for extraction. The molecules in the supercritical fluid have high a kinetic energy (like the gas) and a high density (like the liquid). Therefore, it is expected that the chemical reactivity can be high as well. In addition, the ionic product and dielectric constant of supercritical water, which are important parameters for chemical reactions, can be continuously controlled by regulating pressure and temperature. In addition, the supercritical water can be realized from the ionic reaction field to the radical reaction field (Zhang et al., 2009b). For this paper, liquefaction of corn stover, aspen wood with a pretreatment, and grasses were studied under subcritical and supercritical conditions. The components of the liquid products were identified and compared. Material and Methods Materials Corn stover 2 mm particles were provided by the Agricultural Utilization Research Institute (AURI, Waseca, MN). Aspen pulping wood chips (Populus tremuloides) with a pretreatment were provided by the Department of Bioproducts and Biosystems Engineering, University of Minnesota, St. Paul, Minnesota. High diversity biomass (LIHD: low-input, high-diversity), which contains 18 perennial herbaceous grassland species, was provided by the Department of Ecology, Evolution, and Behavior at the University of Minnesota, St. Paul, Minnesota (Tilman et al., 2006; Zhang et al., 2009a). Biomass were ground in a mill (Thomas Scientific of Swedesboro, New Jersey) to pass through a screen with a 0.5 mm aperture. Apparatus and Process A 75 ml Parr high pressure reactor (Parr Instrument, Moline, Illinois) was used for liquefaction of the feedstock. The reactor consists of a reaction cylinder and a pressure gauge/valve assembly. An induction heating system, which allows the reduction of heat-up times by about two orders of magnitude, was customized by L.C. Miller, Monterey Park, CA(Zhang et al., 2008b). For a typical run, 5 grams of feedstock and 45 ml distilled water were placed inside the cylinder. The cylinder was then sealed and purged through two valves on the reactor head with nitrogen gas at a flow rate of 80 ml/min for 5 minutes in order to remove air and prevent secondary reactions such as thermal cracking and repolymerization; and then the valves were closed. The reactor was heated to 350°C at a heating rate of about 140○C/min, and the desired temperature was held for 10 min. After completing the reaction, the cylinder was cooled down by soaking in the ice bath for 5 minutes. Gases were sampled into a gas bag for GC analysis later. The gas fraction was determined by measuring the weight difference of the reactor before and after gas sampling. 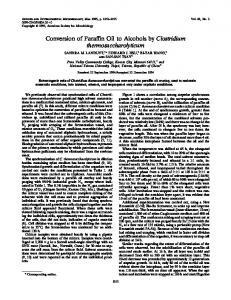 The liquid, including both the water fraction and heavy oil fraction, was collected into a sample bottle for GC-MS analysis later. The procedure for separating aqueous, water insoluble and solid phases in the liquid is shown in Figure 1. ⎞ ⎛ weight of gas ⎟⎟ × 100 Gas yield (% ) = ⎜⎜ ⎝ weight of starting biomass ⎠ ⎞ ⎛ weight of residue ⎟⎟ × 100 Residue yield (% ) = ⎜⎜ ⎝ weight of starting biomass ⎠ ⎞ ⎛ weight of gas weight of residue ⎟⎟ × 100 Liquid yield(% ) = ⎜⎜1 − − ⎝ weight of starting biomass weight of starting biomass ⎠ All experiments and analysis were performed in triplicate. Chemical Analysis A Perkin-Elmer Auto-system gas chromatograph (GC) which houses a 30-meter, 0.53-millimeter (ID) fused silica capillary column (Carboxen 1010 PLOT) (Supelco), was used to analyze the gaseous samples from the liquefaction process. Temperature programmed step-heating was performed as follows: 40○C for 1.7 minutes, 40 ○C/min to 220○C, 220○C for 1.8 minutes. Argon was the carrier gas at a flow rate of 20 ml/min. Two detectors were used for the gas analysis: Flame ionization detector (FID) for carbon-bearing species and thermal conductivity detector (TCD) for H2. Uncertainties in reported concentrations are estimated to be within ±5%. Chemical compositions of the liquid products were identified using a Varian 3 GC/mass spectrometer with a HP-1 capillary column. The GC was programmed at 40○C for 0.5 minute and then increased at 10 ○C/min to 300○C and finally held with an isothermal for 10 minutes. The injector temperature was 300○C and the injection size was 1 µl. The flow rate of the carrier gas (Helium) was 0.6 ml/min. The ion source temperature was 230○C for the mass selective detector. The compounds were identified by a comparison with the NIST Mass Spectral Database. Figure 3 Effect of temperature on gaseous products: A) Pretreated aspen, B) corn stover, C) LIHD However, the residue yield of LIHD decreased from 17-18% to 8-10%, while the final temperature rose from 300°C to 450°C. Figure 4 Effect of time on liquefaction yields of pretreated aspen (A) and corn stover (B). For LIHD, at 300°C, the highest liquid yield of 76.8% was achieved within 6 minutes after the final temperature was reached (total approximately 8 minutes). The reaction was faster at 374°C and the highest liquid yield of 82.1% was achieved within 1 minute after the final temperature was reached (total approximately 4 minutes). A longer treatment time of 30 minutes was more favorable for the production of the gaseous and solid phases, in contrast to the production of the liquid phase (Figures 5A and 5B). The optimal reaction conditions to achieve the highest liquid yield of the various lignocellulosic biomass are different. This may be due to the difference between biomass compositions. Figure 5 Effect of time on liquefaction yields. LIHD was liquefied at 300°C (A) and 374°C (B). GC-MS analysis of the liquid products The components of the liquid products from various biomasses were determined by GC-MS analysis. The mass to charge ratios of the components were checked against the mass spectral library published by NIST. The peak areas shown on the GC spectra were calculated and are given in Table 2. The percentage values indicate the proportions of individual compounds in the liquid and do not represent the actual concentration of these compounds. Within the GC-MS detectable range, the composition difference of liquid products from various origins is able to be identified. The composition of liquid products is found to depend on the composition of the raw materials. Liquid products from corn stover contain 4-ethyl-phenol, 1-(4hydroxy-3,5-dimethoxyphenyl)-ethanone, desaspidinol, 2-hydroxy-3-methyl- 2-cyclopenten-1one, 2,5-hexanedione and 1-hydroxy-2- propanone; and these compounds are barely detectable in the liquid products from the pretreated aspen. The liquid products from the pretreated aspen also contain unique compounds, such as 3-methyl- 2-cyclopenten-1-one, 3methyl-phenol, and 2-methoxy-4-propyl-phenol. Besides, 2,6-dimethoxy-phenol in the liquid products of the pretreated aspen is markedly higher then that of corn stover. Since LIHD is a mixture of 18 species of plants, the liquid compounds from LIHD are significantly greater than those from aspen wood and corn stover, which contain approximately 10 and 19 major components, respectively. – indicates either absent or less than 1% of total area * The area percentages were normalized within listed compounds, which corresponded to ~70% of total area. Conclusion Thermochemical liquefaction of the various lignocellulosic biomass: corn stover, aspen pulp wood (Populus tremuloides) and grasses, was studied. The liquefaction yields were found to be dependent on the final liquefaction temperature, the length of liquefaction time and biomass composition. The major compounds of the liquid products from the various origins were identified by GC-MS. The composition of liquid products is found to depend on the composition of the raw materials. References Demirbas, A. 2000. Mechanisms of liquefaction and pyrolysis reactions of biomass. Energy Conversion and Management 41 (6): 633-646. Demirbas, A. 2004. Current technologies for the thermo-conversion of biomass into fuels and chemicals. Energy Sources 26 (8): 715-730. Goudriaan, F., B.v.d. Beld, F.R. Boerefijn, G.M. Bos, J.E. Naber, S.v.d. Wal, and J.A. Zeevalkink. 2001. 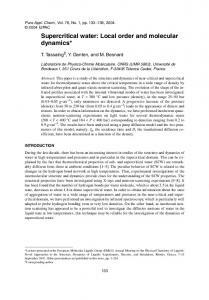 Thermal efficiency of the HTU Process for Biomass Liquefaction, in: Bridgwater, A.V. (Ed. ), Progress in Thermochemical Biomass Conversion. Blackwell Science, Oxford, United Kingdom, pp. 1312-1325. Huber, G.W., S. Iborra, and A. Corma. 2006. Synthesis of transportation fuels from biomass: Chemistry, catalysts, and engineering. Chemical Reviews 106 (9): 4044-4098. Tilman, D., J. Hill, and C. Lehman. 2006. Carbon-negative biofuels from low-input high-diversity grassland biomass. Science 314 (5805): 1598-1600. Zhang, B., M. von Keitz, and K. Valentas. 2008a. Maximizing the liquid fuel yield in a biorefining process. Biotechnology and Bioengineering 101 (5): 903-912. Zhang, B., M. von Keitz, and K. Valentas. 2008b. Thermal Effects on Hydrothermal Biomass Liquefaction. Applied Biochemistry and Biotechnology 147: 143-150. Zhang, B., M. von Keitz, and K. Valentas. 2009a. Thermochemical Liquefaction of High-diversity Grassland Perennials. 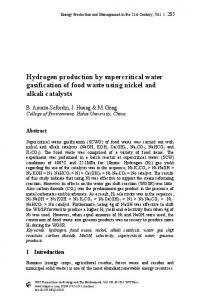 Journal of Analytical and Applied Pyrolysis. 84 (1): 18-24. Zhang, B., M. von Keitz, and K. Valentas. 2009b. Treatment Variables Effects on Supercritical Gasification of High-Diversity Grassland Perennials. Applied Biochemistry and Biotechnology 154: 238-245. 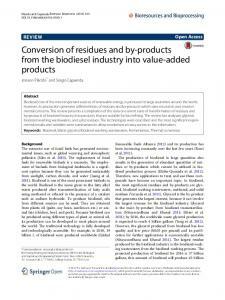 Report "Conversion agricultural residues to bio-crude oil by supercritical water"